they have obtained the authority of the Attorney General or the Charity Commission. A payment in these circumstances is called an ex gratia payment. the payment can in fact be justified as being in the interests of furthering the charity’s purposes, even where there is no power to make it. the trustees are agreed that they are under a moral obligation to make the payment. Our published policy regarding ex gratia payments by charities is set out in the guidance on the website and in CC7. Caseworkers should familiarise themselves with this policy before advising trustees on any aspect of ex-gratia payments. make a decision whether or not we will authorise the trustees to make an ex-gratia payment. Ex-gratia payments usually relate to cases where a charity has been left a legacy in a will. There are other, limited, circumstances that might lead to the making of an ex-gratia payment (see F2). Where appropriate, this guidance provides additional information to deal with the different kinds of cases. B4.1 Has the decision to apply for authority been properly taken by the trustees? B4.2 Is the proposed payment a genuine ex-gratia payment requiring our authority? B4.3 What about small ex-gratia payments? B4.4 Is all of the necessary evidence attached? E2 What does the term 'ex-gratia payment' mean? E3 When might trustees decide that making an ex-gratia payment is appropriate? F1 What is an ex-gratia payment by a charity? F2 What kind of scenarios might lead to a possible ex-gratia payment? F3 What kind of payment might appear to be an ex-gratia payment but is not? F4 What do we do when asked to advise regarding an ex-gratia payment? F5 Who can apply for authority to make an ex-gratia payment? F6 What do we do when we receive a completed ex-gratia payment application form? F7 How do we decide if the proposed payment is an ex-gratia payment? F8 What do we do if it appears that the proposed payment is not an ex-gratia payment? F9 What do we do if it appears that the proposed payment is an ex-gratia payment? F10 What if the proposed ex-gratia payment is a small amount? F11 What if there is more than one charity involved in the case? F12 How do we decide whether or not to authorise the making of an ex-gratia payment? F13 How do we give consent? F14 What do we do if we decide to refuse to give consent? F15 What is a 'moral obligation'? F16 Can the decision to make an ex-gratia payment be delegated by trustees? F17 Can trustees decide to make an ex-gratia payment of only part of a gift? F18 What if the testator's will draftsman had not acted on the instructions of the testator? F19 Do all ex-gratia payments by charities need the authority of the Commission or the Attorney General? F20 What if the charity is governed by an Act of Parliament? F21 How do charities report ex-gratia payment in accounts? The Institute of Legacy Management have prepared, with the Commission's help, a factsheet which sets out how charities' legacy officers approach ex gratia payments. Where we receive a query about ex-gratia payments we will refer the enquirer to the guidance on our website. In most cases, ex-gratia payments will relate to the making of a gift from property already in the possession of a charity. However, occasionally, it can relate to the waiving of a charity's entitlement to property before it has been passed to the charity. Waiving a charity's entitlement under a Will may result in the property not going to the intended recipient because of the wording of the Will or the law of intestacy - in these cases case officers should seek legal advice. The wording of an Order granting authority to waive the charity's entitlement will also be slightly different. In all but exceptional cases, we expect trustees to apply for authority to make an ex-gratia payment by submitting a completed online application form. When we receive a completed application form we will check that the form has been properly completed and that all of the necessary supporting information and evidence is included. Legal advice is always needed. Once it is confirmed that the proposed payment is an ex-gratia payment a member of the Legal SMT must be consulted. If it is likely that we might refuse to authorise the ex-gratia payment the Legal SMT member must consult the Chief Legal Adviser. Once we have all the information and evidence we require we will decide whether or not to authorise the trustees to make the ex-gratia payment. If we decide to authorise the making of the payments we will provide this authority by s106 Order. If we refuse to grant authority we will inform the applicant of the right to apply directly to the Attorney General for authority. This guidance will help the enquirer to understand what is, and is not, an ex-gratia payment. Having considered this guidance, if the trustees are satisfied that the proposed payment is an ex-gratia payment requiring our consent, the trustees should apply for this authority by submitting a completed online application form. Model text to deal with an opening enquiry is available at G1. the possibility of dispute or legal action. Before we take the case forward we should also check to see if there is any reason to question the validity of the application (for example, is the application made by someone who stands to benefit from the payment). If there is, we should contact the charity's named correspondent to ask if the application is validly made. If it is not, we should inform the applicant and close the case. Where the form has been submitted properly and before we consider the contents of the form, we should check the charity's governing document. If this is an Act of Parliament, we may not be able to authorise an ex-gratia payment by s106 Order. If the Act governing the charity prohibits the disposal of the charity's assets, we may need to make a Scheme under s73 of the Charities Act or the Act governing the charity may need to be amended. Caseworkers should take legal advice if the application relates to a charity governed by Act of Parliament. Once we are satisfied that the application is genuine, and that the proposed ex-gratia payment could be authorised s106 Order, we should check that the form is completed fully and that the submission includes all of the evidence necessary to consider the case. If any information or evidence is missing we should ask the applicant to provide this before we consider the case further. Once we have established that the application is validly made we must record the case in CRM. Our policy is that, where the ex gratia payment relates to a gift made in a will, we will record this by creating a Non-Charitable Organisation in Register Plus called 'The bequest of FULL NAME deceased', opening a case in CRM under this NCO and connecting the charity to this case. If more than one charity is applying for consent this can also be connected to the case. Using this convention will mean that the case is easily found in CRM, this is particularly important as most ex gratia payment cases relate to the larger charities so it is often hard to find the ex gratia case in the charity's case list. When we receive a completed application form, we should first of all search Register Plus/CRM to see if the NCO and case have already been created, we should pay particular attention to this where the applicant has indicated that there is more than one charity that is intending to apply for authority. If the NCO and case already exist, we should connect the charity to the case then conduct the case in the usual way. If there is no NCO under the name of the bequest we should create this, open the case and connect the charity. Where the ex gratia payment does not relate to a gift made in a will we should open a case against the charity. Once we have opened the case we must make sure that we record the appropriate issue codes and, once the case is complete, record any powers used. Before we look at the contents of the form, we must first of all make sure that the trustees of the charity are agreed that they are under a moral obligation to make the payments. The trustees need not be unanimous in their decision to apply for authority but the decision must be taken in accordance with the voting provisions in the charity's governing document. Because the decision to apply for authority is based on the trustees feeling under a moral obligation to make the payment this decision cannot be taken by anyone other than the whole body of trustees. The form asks the applicant to upload a copy of the minutes of the meeting at which the decision was taken. We should check the minutes and, if it appears that the decision has not been properly taken in accordance with the charity's governing document, we should contact the applicant to seek clarification. Only when we are satisfied that the decision has been properly taken by the trustees will we consider the contents of the application. If we disagree with the trustees' assessment, we should advise the applicant of this (perhaps by issuing formal advice under s110) then close the case. Before we consider the case made in the application, we must consider whether or not the proposed payment is to settle or compromise a legal claim. A compromise is an agreement that a particular claim by one or more persons against one or more others should not be enforced in Court (or by any other relevant method, eg arbitration). Such an agreement usually involves the payment of an agreed sum by the person(s) allegedly liable to settle the claim to those making the claim (see OG516). Caseworkers should take legal advice if it is unclear whether or not the proposed payment is an ex-gratia payment. Where the amount of money involved is relatively small, say, £1,000 or less, the trustees may feel it would not be administratively sensible to apply for authority to make the payment. In such cases we are unlikely to challenge this. However, if we receive an application for authority for a small payment we will consider this in the same way as any other application. Before we consider the case made in support of the application we must ensure that the applicant has attached all of the evidence we need to inform our decision. The type of evidence depends on whether or not the payment relates to a bequest from a will. The form asks the applicant to explain why the trustees feel under a moral obligation to make the payment and requires that the applicant uploads a copy of the minutes of the trustee meeting at which the decision was taken. (if the proposed payment is less than the full amount of the gift) an explanation as to why the trustees feel under a moral obligation to make a payment of only part of the gift. If any of this information is missing and/or there is insufficient evidence to enable us to make a decision, caseworkers should take legal advice before asking for more information. This will ensure we ask for all the information we need to consider the case. (See E3.2 for examples of ex-gratia payments not related to a bequest in a will). copies of any legal advice the trustees have taken relating to the payment. If there is insufficient information or evidence to enable us to make a decision we should take legal advice to ensure that we ask for all of the additional information we need to enable us to consider the case. Where a gift has been made to more than one charity, and the trustees of each of the charities feel a moral obligation to make an ex-gratia payment, we will need an application and relevant evidence from each of the charities. The charities can, of course, authorise a single applicant to apply on behalf of all of the charities. Where this is the case, it should be clear from the supporting documentation that each of the charities has approved the proposal to apply for consent, but if there is any doubt about the validity of an application we should contact the relevant charity's named correspondent to check that the trustees want to go ahead with the application. There may be cases where a gift has been made to more than one charity where the trustees of some, but not all, of the charities feel under a moral obligation to make the payment. We will consider the case using the same criteria as we would any other case and can authorise a payment by the charity that has applied. Because the decision to make an ex-gratia payment relies on the trustees feeling a moral obligation to do so it is reasonable that some trustees may feel differently to others. The decision whether or not to authorise an ex-gratia payment can be taken by an Authorised Officer in accordance with our Authorised Officer policy set out in OG702. We must only make our decision after taking into account the relevant Human Rights and Equalities legislation. The legal adviser on the case will provide further information (and see OG71 and our Equality Act web guidance). Caseworkers must take legal advice whenever we are asked to authorise an ex-gratia payment. Before making our decision we must always bear in mind that we are being asked to authorise the use of a charity's funds for a non-charitable purpose but it is the trustees' belief that should lead our decision. If the trustees confirm that they feel under a moral obligation to make the payment, and where we are satisfied that the payment is an ex-gratia payment requiring consent, it is unlikely that we would refuse to give this consent. (Although we may want more information before making our decision if we are unclear on any of the relevant matters.) That said, we must consider the evidence provided to ensure that the trustees' decision is one which is within the range of decisions that a reasonable body of trustees might take and only make our decision once we have done this. Caseworkers must take advice from a member of Legal Services SMT when considering whether or not to authorise an ex-gratia payment. If it is likely that we might refuse to authorise the payment, the Legal Services SMT member should consult the Chief Legal Adviser. A decision under s106 of the Charities Act cannot be appealed to the Tribunal but a refusal can be appealed by making a fresh application to the Attorney General. It is important that we consider the case as a whole when making our decision and properly record the reasons for our decision on the case file. Our consideration will vary depending on whether or not the payment relates to a bequest in a will. The will of the deceased. To check that the information provided by the trustees in the application about the terms of the will is accurate. Evidence of the testator's true intentions. This might be a draft will or unexecuted codicil, either of which can usually be taken as an indication of the possible intentions of the deceased (providing there is a credible explanation of why the documents were not brought into effect). Other evidence might be written statements (by statutory declaration or otherwise) from the solicitor of the deceased, or other independent people who were aware of the intentions of the deceased, or anything in writing left by the deceased showing their true intentions. Evidence of why the testator was unable to bring the changes into effect. Once again, this would usually be something in writing from an independent person (who is not the person who would benefit from the ex-gratia payment) to say what prevented the testator from updating the will. This might be because sudden illness or incapacity prevented the testator from signing the will or codicil. There may be occasions where the person who will benefit from the ex-gratia payment is required to provide evidence in support of the case. We would expect this to be provided by means of a Statutory Declaration. Evidence to back up the trustees' assertion that they feel under a moral obligation to make the payment. This might be minutes of meetings, or other records of discussions, leading up to the trustees deciding to make the payment. The decision need not be unanimous but should be taken in accordance with the quorum and voting provisions of the charity's governing document. Evidence of why the circumstances of the case have led to the proposal to make an ex-gratia payment. Where this involves a donor requesting the return of a cash donation or other property, this might be copies of correspondence from the donor setting out why their circumstances have changed to the extent that making the gift in the past has resulted in financial difficulties in the present. we will usually authorise the proposal by Order, see B6. suggests the trustees are not convinced that they feel a moral obligation to make the payment. In either case, if it is likely that we will refuse to authorise an application for authority, the advising member of Legal Services SMT should consult the Chief Legal Adviser. When we refuse to authorise an ex-gratia payment, we must clearly record the reasons for our decision on the case file. If the trustees cannot accept our decision to refuse authority, they can apply directly to the Attorney General for authority. In this case, the Attorney General's decision will overrule ours. Model text for a refusal letter, that sets out the appeal procedure, is available in G2. Once we have decided to authorise the proposed payment, and recorded the reasons for this decision on the case file, we will make an Order under s106 authorising the trustees to make the payment, or, where the payment has not yet been made, to waive the charity's entitlement to the gift. Where more than one charity is involved we must send a copy of the Order to each charity. A selection of case studies is available on our website. These show the kinds of cases we have dealt with in the past and give an indication of how and why we made our decision in each case. The Institute of Legacy Management have produced, with the Commission's help, a factsheet which sets out how charities' legacy officers approach ex gratia payments. Charity trustees must apply charitable funds only in furtherance of the charity's objects, and in accordance with the charity's governing document. However, in re Snowden Dec'd  1 Ch 700;  3 WLR 273;  3 All ER 208 the judge ruled that a charity could make an ex-gratia payment, but only where, if the charity were an individual, it would be morally wrong of him to refuse to make the payment. This power is given by s106 of the Charities Act. This section gives the Commission the same power as the Attorney General (AG) to authorise a charity's trustees to apply charitable property, or to waive the charity's entitlement to receive property, where they have no power to do so and where they regard themselves as being under a moral obligation to give up the property. We exercise this power under the supervision of the AG. The effect of this legislation is that a charitable company whose business, or subsidiary’s business, is being transferred or terminated, can make payments (eg loss of employment compensation) to employees. Whether or not it is in the interests of the company to do so is deemed irrelevant, so even though payments under these provisions are ex-gratia payments these can be made under the power provided by the Companies Act without our authority. This section of the Companies Act is primarily concerned with creditor protection. This gives powers similar to those in s247 of the Companies Act to liquidators who are winding up a company (this includes a charitable company). the trustees cannot justify the payment as being in the interests of the charity. Ex-gratia payment cases that are not related to will cases are rare but these might refer to a proposal to return a charitable donation made while the donor was emotionally distressed and so miscalculated their assets to the extent that making the gift has had a significant negative impact on the donor's personal finances. a payment that can be justified as furthering the charity's purpose. Where the testator's instructions were not carried out because of delay or negligence on the part of the testator's will draftsman then the disappointed potential beneficiary may have a claim against the will draftsman. However, the Commission will still consider applications for authorisation to make an ex gratia payment to the disappointed beneficiary in these circumstances. It will expect the trustees to explain why they consider themselves to be under a moral obligation to make the payment notwithstanding the existence of the claim. Where our authority is required, we expect trustees to apply for this using the online application form. Using the form should ensure that we are given all the information we need to consider an application without further enquiry. If the trustees confirm that they feel a moral obligation to make the payment, and the evidence to support this is satisfactory, we will usually authorise the making of the payment as long as the trustees' decision is one which is within the range of decisions that a reasonable body of trustees might take. Where the trustees appear unconvinced that they feel a moral obligation to make the payment, or where the evidence in support of the application is incomplete or unsatisfactory, it is unlikely that we will authorise the ex-gratia payment. The phrase 'ex-gratia payment' does not have a precise legal definition but, in the context of ex-gratia payments by charities, this is defined in our published guidance (CC7), this definition is set out in E2. In addition to an application of property already in the possession of the charity, an ex-gratia payment can also relate to a waiver of an entitlement to receive property not yet transferred to the charity. There are a number of case examples on our website setting out broad summaries of recent ex-gratia payment cases. The vast majority of these relate to gifts to charities set out in the donor's will. See E3 for some examples of what might lead to the making of an ex-gratia payment. There are some payments that might appear to be ex-gratia payments but are not. We must ensure that we do not deal with these as ex-gratia payment cases. See E4 for examples of payments that are commonly confused with ex-gratia payments. Where we are approached with a query about a possible ex-gratia payment we should refer the enquirer to our web guidance, CC7, and the online application form. This will help the enquirer to decide whether or not the proposed payment is actually an ex-gratia payment. If it is, completing the application form will ensure that the applicant provides all the information and evidence we need to consider the case at the time the application is made. In all cases, trustees must take their own expert advice, we can't advise trustees beyond what is available in our published guidance. See G1 for model text to deal with an opening enquiry. While the decision to apply for authority to make an ex-gratia payment must be taken by the trustees themselves, the application can be submitted by anybody authorised to act on behalf of the trustees. The application form asks the applicant to confirm their role and that they have been authorised to apply on behalf of the trustees. We cannot accept an application from someone who is not acting on behalf of the trustees (for example, a disappointed potential beneficiary or executor). When we receive an application form we must consider if this is properly completed by someone authorised to act on behalf of the trustees. Having done this, we must check the contents of the form to see if the payment is a genuine ex-gratia payment and, if it is, check that the evidence provided is sufficient for us to consider the case. If it is not we will contact the applicant to ask for more detail (see B3). We will decide whether or not the payment is an ex-gratia payment by checking the contents of the form against the criteria set out in E3 & E4. If there is any doubt caseworkers should take legal advice. It is unlikely that we will receive a completed application form where the payment is not an ex-gratia payment as the form is designed to ensure that this does not happen. However, we may still see forms that have been completed and submitted where the payment is not an ex-gratia payment. Where this is the case we should reply to the applicant, setting out why the proposed payment is not an ex-gratia payment needing authority, and suggesting the trustees take their own legal advice if necessary (see B4.2). 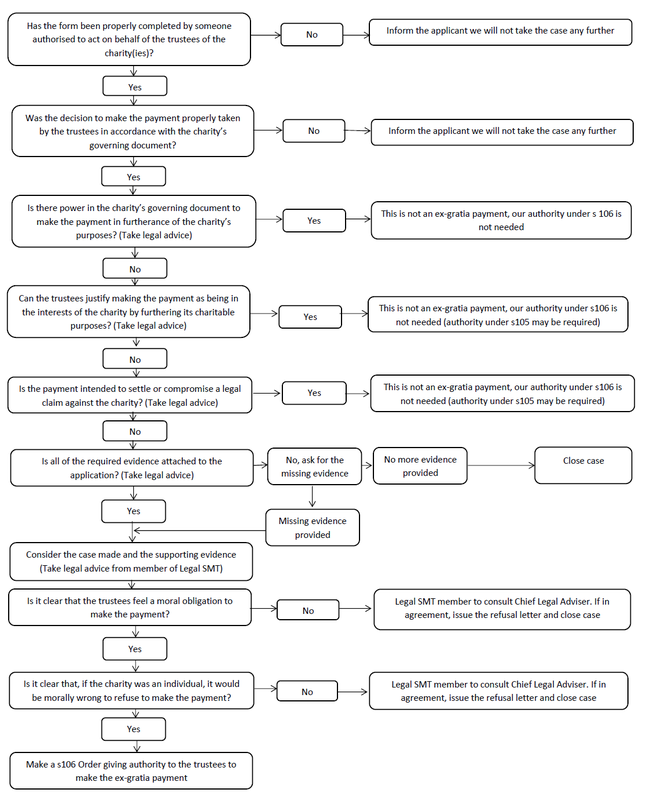 If the proposed payment appears to be an ex-gratia payment requiring consent (and the charity is not governed by an Act of Parliament, see F20) we should consider the contents of the form, and the evidence provided, following the steps in the flowchart in C1. This will help us to decide if we can authorise the payment on the basis of the information provided. It may be that we need more information to make our decision. In this case we must check with a Commission lawyer to ensure that we ask for all the information we need to minimise future correspondence. Once we have all the information we need we will make our decision, see B5. If there is more than one charity involved in the case we can still accept a single application form. The form allows an application to be made on behalf of more than one charity. See B4.5 for more information about the additional issues this raises. We will consider the case made, and the supporting evidence, against the decision making criteria set out in Casework Guidance and the checklist, and will take legal advice in all cases. The decision whether or not to authorise a payment must be taken by an Authorised Officer and in accordance with our authorised officer policy set out in OG702. In making our decision we must take into account all relevant human rights and equalities legislation (see B5). We will give consent by making an Order under s106 of the Charities Act. Where there is more than one charity involved in the case we will send a copy of the authorised Order to each charity by email, in accordance with our usual procedures (see B6). If we decide that the circumstances of the case mean we are not prepared to authorise the payment, having taken advice from a member of the Legal Services SMT and Chief Legal Adviser, we must formally refuse to grant authority. Model text for a refusal letter is available in the Model Letters and Orders section. This model text refers to the route of appeal available to the charity. 'Moral obligation' is defined in CC7 as being where a charity's trustees would "be acting immorally by refusing to make the payment". No, because the decision rests on whether or not the trustees feel under a moral obligation to make the payment this decision must be made by the body of trustees and cannot be delegated. Yes, where it is not clear what provision the testator/testatrix would have made but the trustees consider they would have made some provision. Where the instructions of the testator have not been brought into effect because of delay or negligence on behalf of the testator's will draftsman then any disappointed potential beneficiary might have a claim against the will draftsman. In this case, the charity's trustees need take no action. If the disappointed beneficiary is successful in the claim against the will draftsman then compensation would be paid by the will draftsman (or, more usually, the will draftsman's insurers) and the charity would retain the gift. where the payment is made by a liquidator under s187 of the Insolvency Act 1986 (see E1.3). Neither the Attorney General nor the Commission can grant an authority that goes against the provisions of an Act of Parliament (this includes the making of an ex-gratia payment if the Act prohibits the disposal of the charity's assets). If the trustees of such a charity feel a moral obligation to make a payment that goes against the terms of the charity's governing document (the Act of Parliament) this can only be authorised by a Commission Scheme made under s73 of the Charities Act or by altering the terms of the Act by making an amending Act. Caseworkers should take legal advice if we are asked to authorise the trustees of a charity governed by Act of Parliament to make an ex-gratia payment. Ex-gratia payments should be recorded in the charity's accounts in accordance with the Charities' SORP. Section 240 of the SORP deals with ex-gratia payments. Having looked at this guidance, if it is clear that the proposed payment is an ex-gratia payment requiring authority, the trustees should apply for authority using the online application form. Please note, we cannot accept an application from anyone other than the trustees or someone authorised to apply on behalf of the trustees. If you are dissatisfied with this decision, you can make a fresh application to the Attorney General. This should be sent to the Treasury Solicitor as he/she acts for the Attorney General in connection with such applications.